Trauma is the leading cause of death in individuals up to the age of 45 years and the third leading cause of death overall for every age group. In the USA, trauma accounts for more than 180 000 deaths per year and about 2.8 million hospital admissions . Patients suffering from trauma require care through a multidisciplinary approach. Medical specialties involved may usually include surgery, anesthesiology, critical care emergency medicine, orthopedics, neurosurgery, ophthalmology, otolaryngology, plastic surgery, urology, radiology, cardiac surgery, and blood banking. Anesthesiologists play an integral role in these multidisciplinary teams . Trauma anesthesiologists are prepared to provide immediate care to patients with any form and severity of injury, who may require any kind of operation regardless of the time of the day. Therefore, trauma anesthetists, being part of the hospital trauma team, offer a unique expertise and skill set that are significantly different from those offered by other medical specialists. The mission of trauma anesthesiologists is the resuscitation and perioperative care and management of trauma patients, including pain management . First peak, which comprises patients with serious, generally nonsurvival, injuries. Second peak, which comprises patients with life-threatening injuries, for whom prompt, appropriate treatment may be life-saving. It is these patients to which the advanced trauma life support protocol is directed. Third peak, which comprises patients who die several days or weeks after sepsis or multiple-organ failure; these account for about 20% of the trauma patients . It is the time elapsed between the occurrence of an injury and definitive management and surgical care given. It markedly decreases the mortality rates from the trauma . Trauma is either (a) penetrating trauma; or (b) blunt trauma, which is associated with more mortality rates because it is difficult to diagnose, or is usually associated with more than one organ injury - for example, head injury, chest trauma, abdominal injury, or multiple fractures . (c) New injury severity score. (a) Glasgow come scale (GCS). (d) Acute physiology and chronic health evaluation. (f) Glasgow pediatric coma score. (3) Combined scoring system, which includes the trauma and injury severity scores. What is advanced trauma life support? It is a program that provides a framework on which the immediate management of the trauma patients is based. It is introduced in USA in 1988, it has many controversial aspects as nasal versus oral intubation or crystalloids versus colloids. It introduced the concept of trauma team, which still focuses on the 'golden hour' . (A) For airway with cervical spine control. (B) For breathing with ventilatory support. (C) For circulation and hemorrhage control. (D) For disability and neurological function assessment. (E) For exposure without hypothermia. (2) Neck lift-head tilt maneuver. The abovementioned procedures should be carried out while avoiding the neck extension/flexion if there is a risk for cervical spine injury. Any foreign bodies visible in the mouth or vomitus must be removed by using the index finger in case of unconscious patients. If the patient is conscious, and is standing up or lying down, oral foreign bodies can be removed by performing subdiaphragmatic abdominal thrusts (Heimlich maneuver), which elevate the diaphragm expelling a blast of air from the lungs, thus displacing the foreign bodies. But this maneuver has some complications, such as rib fracture, trauma to internal viscera, or regurgitation . For the suction of oral content, more advanced techniques can be used to maintain patient airway, such as oropharyngeal or nasopharyngeal airway, tracheal intubation especially for patients with GCS less than 8, or any one with risk of aspiration, tracheostomy with local anesthesia, or even emergency cricothyrotomy for acute upper airway obstruction. Simply, if a patient can talk, this means the airway is clear. Cervical spine must be assessed for suspected fracture; moreover, an assessment of the airway should be carried out. Cervical spine fracture occurs in 1.5-3% of all major trauma victims and 10% of the severe head injury victims. Cervical spine fracture is suspected if a conscious patient reports any neck pain, tenderness, or any neurological symptoms after trauma. The cervical spine should be stabilized with manual in-line stabilization or using a neck collar. Care should be taken during patient transportation as the patient should be transported in one line. Nasal intubation or nasopharyngeal airways should be avoided if skull-base or mid-face fractures are suspected . Breathing is assessed by using the look, listen, and feel approach: look for chest-wall movement, cyanosis, use of accessory muscles, flail chest, paradoxical abdominal movement (this indicates airway obstruction), and penetrating chest injuries and bruises; listen for the presence, absence, or diminution of breathing sounds; and feel for airflow, subcutaneous emphysema, tracheal shift, and broken ribs. Breathing is maintained through oxygenation. In some cases, mouth-to-barrier device ventilation may be needed; tension or open pneumothorax and hemothorax should be suspected in trauma patients. An advanced technique, such as using a self-inflating bag with a nonrebreathing valve connected to a face mask or an endotracheal tube, can be used for better outcome; furthermore, mechanical ventilation may be necessary in some cases . If the patient's radial pulse is present, the systolic blood pressure is greater than 80 mmHg; if femoral pulses are present, the systolic blood pressure is greater than 70 mmHg; and if carotid pulses are present, the systolic blood pressure is greater than 60 mmHg. Radial present: systolic blood pressure more than 80 mmHg. Femoral present: systolic blood pressure more than 70 mmHg. Carotid present: systolic blood pressure more than 60 mmHg. Shock is defined as tissue under perfusion. During advanced trauma life support, two 14 G cannulae should be inserted for intravenous access. There is increasing evidence that attempting to establish normovolemia before surgical hemostasis dislodges any blood clots and accelerates the rate of bleeding. Moreover, intravenous fluids at this stage cause dilution of clotting factors and hypothermia, which increase the overall morbidity and mortality. Until hemostasis is achieved, a systolic blood pressure of 80 mmHg, which is thought to be adequate to perfuse vital organs, should be maintained. Prehospital care : The prehospital care team should work to prevent further injury, transport the patient to the hospital as rapidly as possible, and initiate the appropriate treatment in the fluid. Direct pressure should be applied to external bleeding vessels to prevent more blood loss . In recent years, there has been considerable debate regarding the use of military antishock trousers (MAST). MAST were first introduced in the 1960s and became a standard therapy in prehospital treatment of hypovolemic shock; however, now, the American College of Surgeons no longer recommends the use of MAST . Quantity and type of fluids to be used in resuscitation : Once intravenous access is obtained, fluid resuscitation is initiated using an isotonic crystalloid, such as a lactated Ringer's solution or normal saline. An initiated bolus of 1-2 l is given to an adult and 20 ml/kg to a pediatric patient, and then the patient response is assessed. If vital signs return to normal, the patient may be monitored to ensure stability, and blood should be sent to be typed and cross-matched. In case of little or no improvement, crystalloid infusion should be continued and type 0 Rh-negative blood should be given . Autotransfusion may be a possibility in some patients with trauma. Several devices that allow for sterile collection, filtration of anticoagulation, and retransfusion are now available. Usually this blood is collected from the hemothorax by using tube thoracotomy. Recent studies show no difference in outcomes among ICU patients receiving crystalloids compared with patients receiving colloids (especially human albumin) as a primary fluid for resuscitation. In addition, meta-analyses have failed to demonstrate any improvement in morbidity or mortality in trauma patients regarding the use of hypertonic saline in restoring blood volume . Recent studies suggest that the early administration of fresh frozen plasma and platelets improves survival and decreases overall red blood cells needed in patients undergoing massive transfusion. (a) Assessing GCS and pupils. Checking cord function by observing arms and legs for spontaneous movement. The patient is completely undressed to examine the whole body for any hidden injuries; as it correlates with mortality, hypothermia is prevented by covering the patient with a blanket. Furthermore, in-line immobilization during transportation is important if a cervical or any spinal cord injury is suspected . This involves a systematic head-to-toe survey to assess the injury and other associated injuries. (1) Radiography for chest, skull, vertebral column, pelvis, and long bones. (2) Whole body computed tomography scan. (4) Transcranial Doppler for head trauma. (5) Echocardiography (usually avoided as it is time consuming for hemodynamically unstable patients). (c) Assessment of the past medical condition by history taking, examination, and investigations. (d) Assessment of the airway for difficult intubation. (e) Assessment of risk for aspiration as all trauma patients are considered to have full stomach as gastric emptying stops by the time of the trauma; thus, precautions against aspiration should be taken . (a) It is better to delay the surgery for as long as possible to allow for proper preoperative resuscitation together with full trauma survey. (iii) Better invasive if hemodynamic instability is suspected. (vi) Urine output by using Foley's catheter. (vii) Temperature props to avoid hypothermia. (ix) Other more invasive monitors as pulmonary artery pressure or central venous pressure according to patient condition. Regional anesthesia is impractical and may prove to be a time-consuming procedure in hemodynamically unstable patients. Therefore, usually, general anesthesia should be induced. Rapid sequence induction by using cricoid pressure, inhalational induction, or awake intubation using a fiberoptic device can be carried out if controlling airway resistance is doubtful or if difficult intubation or maxillofacial trauma is suspected. The trauma team should be on guard for aspiration. As regards opioid-based anesthesia, ketamine and N 2 O are avoided as they can display cardiodepressant effects in shocked patients who already have maximal sympathetic stimulation. N 2 O is also avoided to allow an increase in FIO 2 . Awake extubation is performed in the lateral position. In case of airway or maxillofacial surgeries, patient is left intubated for several days because of the presence of airway edema. (3) Avoiding postoperative complications such as hypothermia, disseminated intravascular coagulopathy, or acute respiratory distress syndrome. (1) Prolonged hypoperfusion state for any cause. (4) Aspiration of gastric contents. (5) Previously severe pulmonary disease. Special attention should paid during the management of severe traumatic brain injury (TBI). A significant proportion of patients with TBI have hypotension (systolic blood pressure<90 mmHg) and/or hypoxemia (PaO 2 <60 mmHg), which increases morbidity and mortality. The optimal cerebral perfusion pressure is unknown but cerebral ischemia occurs below 50-60 mmHg, and thus a minimum of 60 mmHg is recommended. There is no evidence regarding the beneficial effects of vasopressors or high-volume expansion. Patients with severe TBI lose weight at a rate of 15% per week. Weight loss of greater than 30% is associated with increased mortality in patients with TBI. High-protein nutrition regimen with low glucose should be advised. (1) Routine seizure prophylaxis is not indicated in patients more than 1 week positivity. (2) No good evidence exists to support hyperventilation following TBI. (3) There is evidence that high-dose steroids worsen outcome in TBI patients, and thus should be avoided. (4) Barbiturates have been shown to control elevated ICP, but there is no evidence for any improvement in long-term survival, and thus are better avoided due to their hypotensive effect. When to involve the neurosurgeon in management? (1) Discuss the care plan. (2) New results in the investigations. (3) Persisting coma (GCSͳ8) after initial resuscitation. (4) Deterioration in GCS after admission. (6) Seizure without full recovery. (7) Definite or suspected penetrating injury. In all circumstances, complete initial resuscitation and stabilization of the patient are carried out, and before transfer, the patient is comprehensively monitoring to avoid complications during the journey. If, despite resuscitation, patient is persistently hypotensive, he or she should not be transported until the cause of hypotension has been identified and the patient stabilized. (3) The healthcare providers themselves, especially the anesthesiologists ( many strategies have been implemented to decrease the post-traumatic stress disorders. The most commonly used tool is the critical incident stress debriefing system, which is based on group discussion and talking out emotionally charged issues). Trauma is the leading cause of death for individuals up to the age of 45 years and the third leading cause of death overall for every age groups. In the USA, trauma accounts for more than 180 000 deaths per year and about 2.8 million hospital admissions. Trauma anesthesiologists are prepared for providing immediate care to patients with any form and severity of injury, and who may require any kind of operations regardless of the time of the day. It is a program that provides a framework on which the immediate management of the trauma patients is based. It is introduced from the USA in 1988, it has gone controversial aspects as no anesthetic input to first edition, nasal versus oral intubation, colloids versus crystalloids, it introduced the concept of trauma team, still focuses on 'golden hour'. For disability and neurological function assessment. Regional anesthesia is impractical and may be a time-consuming procedure in hemodynamically unstable patients. Therefore, usually, general anesthesia is given. Awake extubation in carried out in the lateral position. Postoperative management usually takes place in ICUs. In all circumstances, complete initial resuscitation and stabilization of the patient are carried out, and before transfer, the patient is comprehensively monitored to avoid complications during the journey. Royal College of Surgeons of England. Report of the working party on the management of patients with major injuries. London: Royal College of Surgeons of England; 1988. Brain Trauma Foundation. Guidelines for the management of severe traumatic brain injury; 2007. Available at: http://www.braintruama.org/site/page server?pagename=guidelines. NICE. Head injury: triage, assessment, investigation and early management of head injury in infants, children and adults. NICE clinical guidelines 56; September 2007. Available at: http://www.nice.org.uk/nicemedia/pdf/CG56QuickRedGuide.pdf . 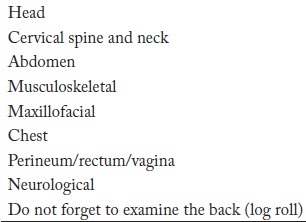 Brüssel T. Anaesthetic considerations for acute spinal cord injury. Curr Opin Anaesthesiol 1998; 11:467-472. Dutton RP. Fluid management for trauma; where are we now?. Contain Educ Anaesth Crit Care Pain 2006; 6:144-147. National Confidential Enquiry into Patient Outcome and Death. Trauma: who cares? 2007. Available at: http://www.ncepod.org.uk/2007t.htm. Nolan JP, Parr MJ. Aspects of resuscitation in trauma. Br J Anaesth 1997; 79:226-240. Shaz BH, Dente CJ, Harris RS, MacLeod JB, Hillyer CD. Transfusion management of trauma patients. Anaesth Analg 2009; 108:1760-1768. Strandvik GF. Hypertonic saline in critical care: a review of the literatue and guidelines for the use in hypotensive states and raised intracranial pressure. Anaesthesia 2009; 64:990-999. Brooks AJ, Rowlands BJ. Blunt abdominal injuries. Br Med Bull 1999; 55:844-855. Dutton RP. Airway trauma. In: Yao FF, Fontes ML, Malhotra V, editors. Anaesthesioology problem-oriented patient management. 6th ed. Lippincott Williams & Wilkins; 2008. 3. 993-1006. Dutton RP, Sharrar SR. Trauma. Int Anaesth Clin 2002; 40:1. Little WC, Freeman GL. Pericardial disease. Circulation 2006; 113:1622-1632. Spodick DH. Acute percarditis: current concepts and practice. JAMA 2003; 289:1150-1153. Wall MJ, Mattox KL, Wolf DA. The cardiac pendulum: blunt rupture of the pericardium with strangulation of the heart. J Trauma 2005; 5:136-141; discussion 141-142. Trunkey DD, Lewis FR. Current therapy of trauma. 4th ed. Mosby-Yearbook; 1999.